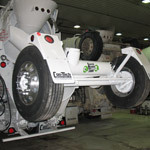 The award winning Booster Washout Tank® is the easiest and most cost effective solution for controlling a readymix truck's chute wash water. Simply attach a capped end chute, position it over the Booster Washout Tank® and wash out the chutes. A perforated plastic bucket catches and cleans any aggregate while gray water is collected in the Booster Washout Tank®. If extra chutes need to be rinsed, the last three will extend beyond the Booster Washout Tank®. The driver simply washes out into a five gallon bucket and dumps it into the tank. Once the chutes are washed, the booster is raised and positions the tank below the charging hopper. A simple hand cable releases the hose allowing gravity to drain the tank into the drum. 952-432-7132 or email us at Sales@BoosterWashout.com. *The above brochure is in Adobe Acrobat Reader (.pdf) format.